Private lessons are now available with Kim or Dan Christian via the internet and a free download program called Skype. Now you can study with fantastic teachers who have over 30 years teaching experience from the comfort of your own home! Just imagine! Now you can study with some of the best teachers available, just by connecting to the computer! The sound quality and video make it seem as if you are literally in the same room with your teacher! Via Skype, you are in virtual music lesson studio where Kim or Dan can work with you personally. 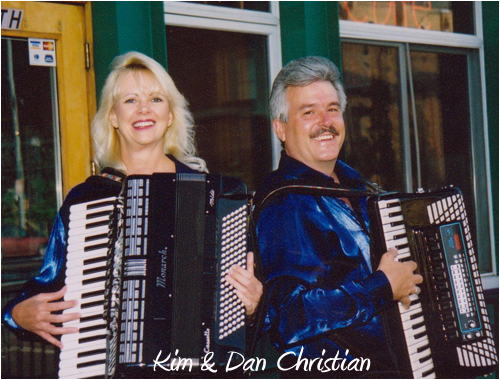 The Christian's will work with you at the level you are and help you build all the skills necessary to become a fantastic accordionist. You will learn how to build your technique so that you can play faster and cleaner. You will learn how to interpret music and add beautiful expression, so that even the simplest melodies sound absolutely gorgeous. You will learn how to master the bellows, so that the phrasing in your music sounds as if you were singing the piece. You can also learn advanced bellows shake techniques, chording, how to arrange music for the accordion from piano pieces, and anything else you want to learn. Your lessons will be tailored to what it is you would like to learn. Also, the Christian's believe in teaching technique from certain pieces, etc., but it is also very important that you are playing the styles of music that you enjoy playing. So, whether you are just starting out, or you are working at the virtuoso level and want to master your instrument, you have found the right place! Seven former students of Kim and Dan Christian received full music scholarships to Denver University's prestigious Lamont School of Music. All you do is just set up a lesson time and meet with Kim or Dan live on the computer once a week for intense, private training. The Christian's work with you at your level and help you become the best player you can be. Call now to get scheduled while lesson times are still available! Lesson prices are: $25 for private half hour and $45 for private hour! Copyright© 2013 Accordions Worldwide. All rights reserved.